I have a terrific new book to recommend: Hour of the Beast. Of course, I’m a wee bit prejudiced, since I wrote it! That’s right, folks. My much-anticipated first novel has been published at last. You can order it at any bookstore, and it’s available on Amazon. But the easiest, fasted and cheapest way to get it is at http://freedomshammer.com. Best of all the eBook is a steal at $5! The nightmare begins on a lonely country road when young bride Elaine Stern suffers “a fate worse than death” at the hands of a werewolf. Nine months later, the traumatized woman gives birth to a pair of fraternal twins. One, Jason, is frail, bespectacled and timid. The other, Joshua, is aggressive and hairy, with uncanny strength. When the boys are in their teens, they arrive atHallertonCollege, a mysterious place where weird things tend to happen even before they get there. The horror goes into overdrive when a string of grisly murders paralyzes the campus. As the body count mounts, Jason begins to suspect that his brother has inherited the curse of lycanthropy. He races to find a cure, enlisting the help of the wise, adventurous and beautiful Professor Cairo Oldewood. Also along for the ride are Cameron, a gorgeous blonde coed, and Jason’s roommate Dylan, a fearless extreme-sports junkie who will do anything for a thrill — even face the full fury of a rampaging monster. Together, to save Joshua’s soul, they must solve a centuries-old mystery before the full moon rises again, and before the hour of the beast is upon them! – John J. Stevens, author of Fire Island. – J.e. Franklin, winner of New York Drama Desk Award. And you can bet your sweet bippy Stephen King will feel exactly the same way as soon as he’s done reading it. So, visit the website and order your copy – plus the dynamite poster of the cover art by the great British artist Martin McKenna, and a t-shirt while you’re at it. (Key chains, caps, mugs and of course Hour of the Beast thongs are on the way). 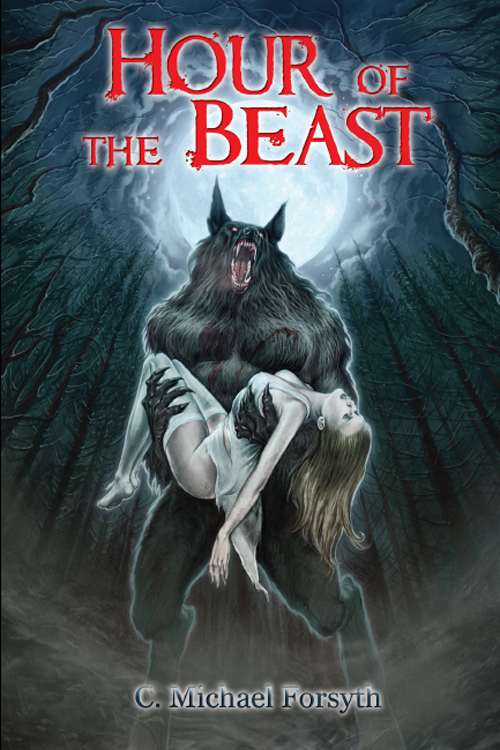 Or run, don’t walk to your nearest bookstore to order your copy of Hour of the Beast.